I've finally taken up this book which I've had on the shelves for ever so long, in honour of the blog world's Virago Reading Week, organized by Rachel at Book Snob and Carolyn at A Few of My Favourite Books -- it is so much fun to read this book, and then read a whole bunch of other reviews of Virago reading. There are already round-ups at Rachel and Carolyn's blogs so be sure to take a look at everyone else who has been reading this week. Now, on to my impression of Angel. This is the second Elizabeth Taylor I've read -- the first was Palladian, and I'm sorry to say it made such a pale impression that I read it twice without realizing until the last chapter that I'd read it previously. So I was hoping that this one would strike me a little more. And it did. Angel Deverell is fifteen at the beginning of this book, and is notable for her wild, passionate romanticism in the arena of her imagination, unleavened by any sense of humour at all, especially when it comes to herself. When she tells lovely, elaborate stories about her 'true home', Paradise House, and all its glories, she is called out as a liar and an embarrassment to her hardworking mother, who owns a corner grocery store. Angel is outraged, not by her actions but by the lack of understanding and admiration that she expects. Deciding that she will never return to the school that was the site of her humiliation, she writes, in a white heat, a torrid romantic novel. Sending it off randomly to three publishers, Angel has an unbelievable stroke of luck and has her book accepted. To her this makes perfect sense and is not a sign of luck or fortune, but only natural. The book, laughed at by many in the publishing house, captures the public imagination and sets Angel on the path of a wildly successful writing career, writing overblown romantic sagas featuring aristocrats and huge houses and melodrama. The novel skips the years between Angel's first book and her established career. When we meet her again, after her astonishing debut, she is living in a much more respectable area of town, where her mother feels out of place and lonely. Angel, however, is as much of a self-centred diva as always. It's Angel and her strange, domineering personality that this book centres around. In all the situations she finds herself, reality is never as important as her belief in how things should be. This chutzpah carries her through for a long, long time -- along with various meek women, like her mother, who act as her prop and support in relation to the real world. Along the way, Angel must encounter and puzzle out various human relationships, unable to see them in their true state. Her vanity is enormous and is the root cause of all her difficulties. Only near the very end, when she is finally broke and nearly forgotten in her crumbling Paradise House, does the possibility of light dawning arise. Alas, it is too late. She is left with only two people to mourn her. I can't say I enjoyed this, exactly. 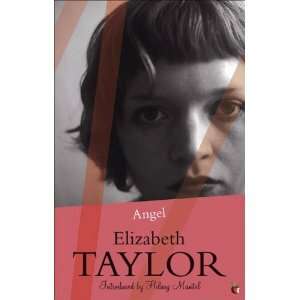 It was painful reading at times, with the reader complicit in the embarrassment of those watching Angel in her element. Her personality, while vitally strong and able to sweep all before it, wasn't exactly endearing. Only one or two of the characters in the book were able to see the desperate longing and fragility beneath her vast ego -- and I don't think that Angel was one of them. I couldn't really see where the story was going, either. What was the reader intended to take away from this? I am still not sure. There is something about Elizabeth Taylor's writing that seems to elude me. While I found this one much more intriguing and memorable than Palladian, I don't think it will be one I'll read again. I'm going to give a couple of her other books a try and see if I can find a way in. There was also a 2007 movie made from Angel, starring Romola Garai, which I may watch someday. I am curious as to how they could portray this book on screen. Has anyone else read this? What do you think of it? Hello Melanie! Thanks for taking part in the Reading Week. It's lovely to find your blog! I'm sorry that you didn't enjoy Angel more - I know she's a hateful character, but other Elizabeth Taylor's are much different and perhaps more enjoyable, so don't give up on her altogether! This was the first of Elizabeth Taylor's novels that I've read and so I have a particular fondness for it on that count as well: it's a favourite of mine. But, as Rachel has said, some of her others have a very different feel to them. (Palladian wasn't a favourite of mine overall.) You might enjoy either Mrs. Palfrey at the Claremont or At Mrs. Lippincote's more...if you're still game to try again sometime! I've read two Taylor novels (In a Summer Season and The Sleeping Beauty), and I liked them both, although the stories didn't stick with me long. I remember liking the moods she created, though. The story of Angel does sound interesting! I may look for a copy of it.